Two students sat alongside 44 faculty members at the latest Strategic Academic Plan (SAP) town hall on Jan. 18. 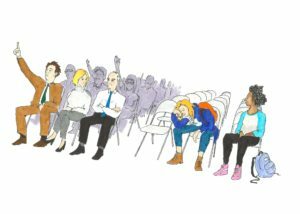 Members of the campus community criticize the plan for multiple reasons, but at Friday’s town hall, the two undergraduates focused on the lack of student involvement. Multiple faculty members also voiced their concerns at the town hall, questioning the speed of the plan’s development, its focus on external funding and its intention to enhance UCSC’s status among other universities. The SAP, originally proposed in 2017, is UC Santa Cruz’s academic plan to tackle areas of education the administration wants to focus on for the next five years. The SAP’s original goals aimed to build stronger programs for students, create new research opportunities for faculty and heighten UC Santa Cruz’s global impact. These goals are categorized as Design Principles, Academic Priority Areas and Barrier Reduction Projects. Previous feedback on the plan requested more transparency in the planning process, and the committee responded by posting notes from all group meetings on the SAP website. Written and published on Dec. 17 by Vice Provost of Academic Affairs Herbie Lee, the new draft discussed at the town hall explains what each area consists of and what SAP hopes to accomplish in more detail. However, it’s hard to understand exactly what the SAP is trying to accomplish or what its process is by reading the draft, Christy Renderos said. She believes the language is still broad and glosses over complex subjects. Lee agreed it could be difficult for students to understand. He proposed it is something he and Tromp could make more clear. Students want clarification on the language of SAP, but the pop-up office hours, called Cafe SAPs, are at inconvenient times, said third-year Emely Carmona. Three of the four Cafe SAPs were at 8:30 a.m. on weekdays and lasted for an hour. One of them took place during finals week, off campus at the UCSC Scotts Valley Center. Lee explained the Cafe SAPs are held early in the morning in hopes of fewer conflicts with attendees’ schedules. He also said the Cafe SAPs focus on communicating with faculty more than students, but the turnout is small with about five to 10 people at each event. Lee and his staff have met with about half a dozen faculty members throughout the Cafe SAPs. Lee also said he is working on a new plan to involve more students, ideally within the next month. He added students can provide feedback on the SAP website. But the students at the town hall expressed that understanding the SAP and coming up with feedback is difficult due to the complicated language and lack of student outreach. To provide feedback on the SAP, email academicplan@ucsc.edu. Additional reporting by Gillian McFerren.